A mohair limited edition rabbit from the Steiff series of pastel rabbits. 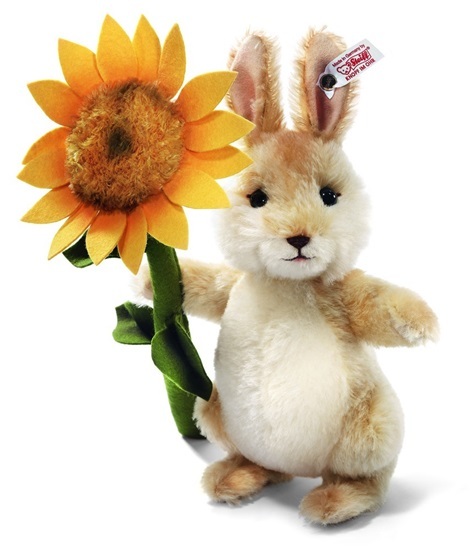 We are pleased to introduce "Sunny" Steiff's 2013 Springtime rabbit,, the latest in their series of pastel rabbits. "Sunny" is handmade in Germany from pale yellow and white mohair and holds a sunflower that is truly beautiful. The sunflower is hand-sewn of wool felt and velboa fabric and delicately airbrushed for extra realism. "Sunny" is lovingly hand-stitched by experienced Steiff artisians. She is 9-inches tall and one-way jointed at her neck. "Sunny" is a limited edition of 1500 pieces and a North American Exclusive. She has a gold-plated button in the ear.